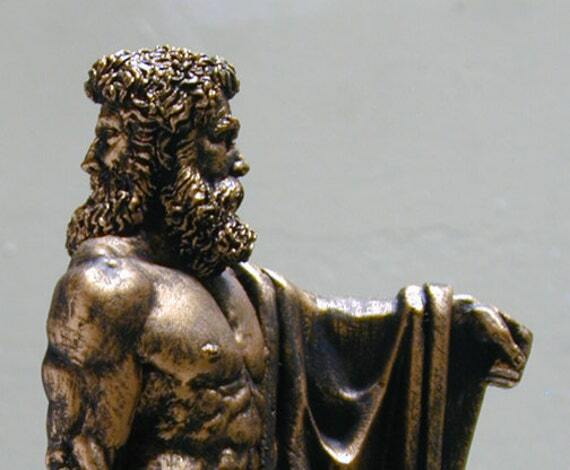 Ianos (Janus) is a God of beginnings and ends; and with that duality, which was sprung when the Celestial Demiurge’s Word (Logoi) of creation was spoken. His association with beginnings and ends goes further, as He also presides over every entry and exit, as well as doors and gateways. He is also a God of conflict and resolution; as well as births and transitions. He is the gatekeeper of Olympus, and as the sentry, He permits the prayers of mortals to enter and be received by the Gods. It is, for this reason, why He is invoked at the beginning and end of all prayers and sacred rituals. Janus’ iconography reflects his tied nature to duality, being commonly depicted as a God who bears two faces. He is also associated with keys and staffs. It is said that he serves as the namesake for the month January, the first month of the year which is sacred to Him, though ancient sources also claim Juno (Hera) is the basis of it. With all the association of beginnings and ends, and thus duality, Janus can be understood as a gateway deity; a deity that can be invoked at the beginning of every ritual, no matter who the ritual is dedicated to. Agonalia, celebrated January 9th, March 17th, May 22nd and December 11th, this is where the rex sacrorum would make the sacrifice of a ram to Janus. The beginning of every month, the Kalends. Of any prayer or ritual as a gateway deity, as it is He who presides over its beginnings and it is He who presides over its end. It is common that sweet things are offered to Janus. Crystalinks Editors. “Janus – God of Gates and Doors.” Crystalinks. Accessed September 02, 2017. http://www.crystalinks.com/janus.html. Nova Roma. “Ianus.” NOVA ROMA Dedicated to the restoration of classical Roman religion, culture and virtues. Accessed August 17, 2017. http://www.novaroma.org/nr/Janus. HonorTheGods. “January 1st.” Honor the gods. January 01, 2018. Accessed January 01, 2018. http://honorthegods.tumblr.com/post/169173609528/roman-silver-coin-obverse-janus-with-laurel. Philo , L. Curtius. “Gods (Roman Republic).” Roman Republic: RES PVBLICA ROMANA. March 28, 2016. Accessed September 02, 2017. http://romanrepublic.org/bibliotheca/wiki/gods.html. Wasson, Donald L. “Janus.” Ancient History Encyclopedia. February 06, 2015. Accessed September 02, 2017. http://www.ancient.eu/Janus/.